Floor scrubbers for sale come in all shapes and sizes. From small corded machines to large battery- or fuel-powered behemoths, there are indeed many options from which to choose. 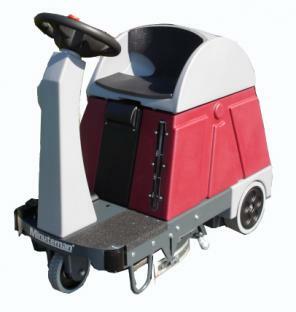 For properties with a large amount of floor space, however, the ride-on variety is generally the best option due to the larger scrubbing width, reduced operator fatigue, larger water/detergent storage capacity and more. All these features equate to one major advantage: enhanced productivity. These three significant advantages are explained below. Cleaning a large area with a traditional walk-behind machine can be time-consuming and tedious. With wider scrubbing paths made possible by ride-on scrubbers, efficiency and better productivity are easily achieved. These machines are mechanically propelled, so navigating a wider path is easier. The ability to hold a larger amount of cleaning solution is a major advantage ride-on scrubbers enjoy over walk-behind varieties. Better storage capacity means fewer trips to the water/detergent source. This, in turn, can help save a lot of minutes and possibly even hours at every cleaning job. Since an operator is riding instead of walking while he cleans your floor area, fatigue is reduced, which means your operator is physically able to maintain a more productive work rate. Put simply, with ride-on scrubbers, your operators will be able to do more with less. Ride-on scrubbers make for an all-around cleaner facility. Simply using a scrubber is already a big improvement over manual mopping, but when you add the many significant advantages that ride-on scrubbers offer into the equation, the benefits are amplified. That being said, while ride-on scrubbers do come with many benefits, they are not suitable for in smaller spaces. Housekeeping managers must first weigh the size and storage space of their facilities, their cleaning needs, staffing requirements, and budget to learn if a ride-on scrubber is the right equipment to buy. If you can’t justify its purchase, don’t worry; cleaning equipment manufacturers like Minuteman International boast of a wide array of cleaning products and equipment such as burnishers, carpet cleaning equipment, sweepers, and quality floor scrubbers of both the walk-behind and ride-on varieties.